The 2019 Mazda CX-5 is offered in five trim levels and they include the Sport, Touring, Grand Touring, Grand Touring Reserve, and Signature. All five of these trim levels are adorned with sculpted and breathtaking KODO: Soul of Motion exterior styling and equipped with an efficient and powerful SKYACTIV® drivetrain. You can compare all of the standard and available equipment of the 2019 Mazda CX-5 right here below and you can climb into the cockpit of the 2019 CX-5 at Royal South Mazda in Bloomington, IN today. What are Differences Between the Trim Level Options of the 2019 Mazda CX-5? The 2019 Mazda CX-5 Sport, Touring, and Grand Touring all get equipped with a 2.5L SKYACTIV®-G 4-Cylinder engine that supplies it with 187 horsepower and 186 lb-ft of torque. This standard engine pairs with the SKYACTIV®-Drive 6-Speed Automatic Transmission to achieve EPA fuel economy estimates of 25 MPG City/ 31 MPG Hwy in Front-Wheel Drive (FWD) and in available All-Wheel Drive (AWD) they average 24 MPG City/ 30 MPG HWY. The Grand Touring Reserve and Signature trim levels of the 2019 Mazda CX-5 are loaded with a 2.5L Dynamic Pressure Turbo SKYACTIV®-G 4-Cylinder engine that increases performance to 250 horsepower and 310 lb-ft of torque. This turbocharged engine also works with the SKYACTIV®-Drive Automatic Transmission and standard AWD to obtain EPA fuel efficiency estimates of 22 MPG in the city and 27 MPG on the highway. What are the Color Options for the 2019 Mazda CX-5? 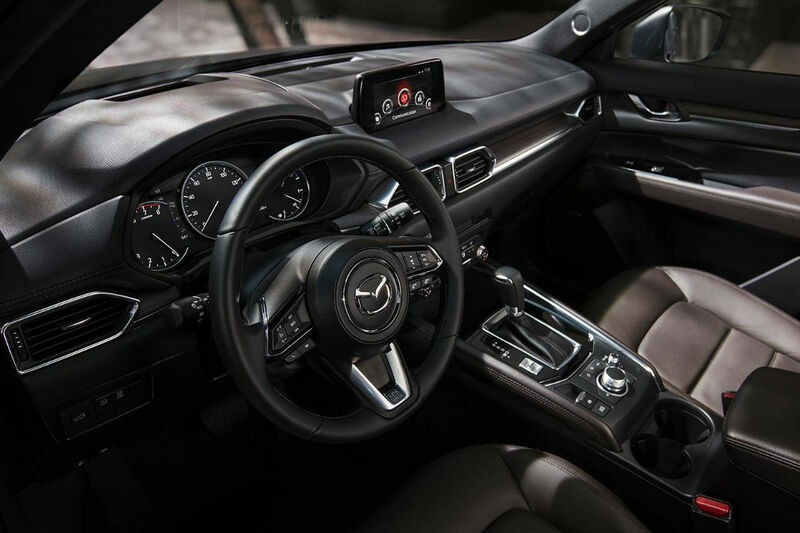 All five trim levels also receive a standard 7” Color Touchscreen Display, a Rearview Camera, Bluetooth® Connectivity, HD Radio™, Two (2) USB Inputs, and the MAZDA CONNECT™ Infotainment System. 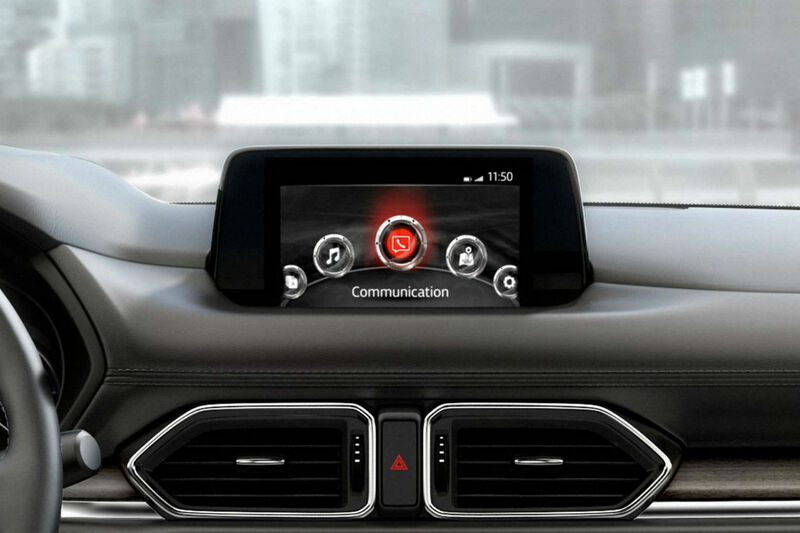 The MAZDA CONNECT™ infotainment system equips the 2019 CX-5 with infotainment voice control, a radio broadcast data system, as well as Aha™, Pandora®, and Stitcher™ internet radio integration, and E911 emergency notification. The 2019 Mazda CX-5 Touring trim level adds Dual-Zone Automatic Climate Control, Heated Front Seats, Leatherette Seats with Lux Suede® Inserts, Apple CarPlay™ & Android Auto™, and four (4) USB Inputs. Move up to the 2019 Mazda CX-5 Grand Touring and owners are rewarded with a Power Sliding-Glass Moonroof, an Auto-Dimming Rearview Mirror with HomeLink®, Leather-Trimmed Seats, a 10-Speaker Bose® Stereo, the Mazda Navigation System, and a 3-Month trial of SiriusXM® Radio and 3-Years of SiriusXM® Traffic & Travel Link. 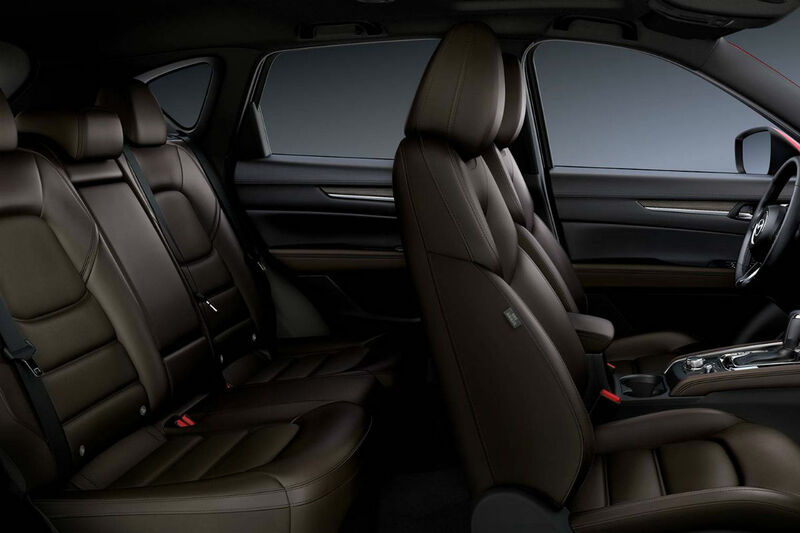 The Grand Touring Reserve trim level adds Ventilated Front Seats, Heated Rear Seats, and even a Heated Steering Wheel. Finally, the 2019 Mazda CX-5 Signature trim gets Caturra Brown Nappa Leather-Trimmed Seats, Genuine Layered Wood Trim, and Black Cloth Headliners. You can take the 2019 Mazda CX-5 for a test drive today at Royal South Mazda to figure out which trim level option is right for you. How Much Horsepower & Torque Does the 2019 Mazda CX-5 Have? This entry was posted on Monday, January 14th, 2019 at 6:56 pm	and is filed under Mazda CX-5, Trim Comparison. You can follow any responses to this entry through the RSS 2.0 feed. You can skip to the end and leave a response. Pinging is currently not allowed.